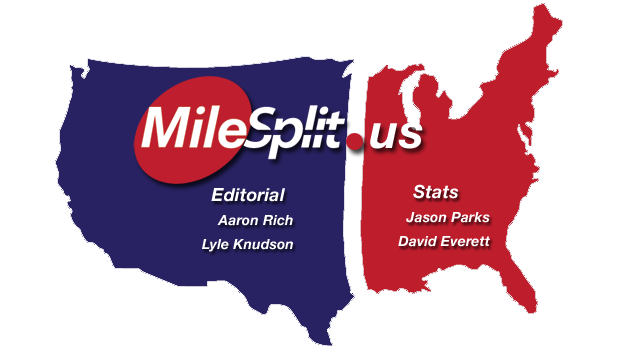 MileSplit 5/12/12 Wknd: Fast 1500's in MA! Baird blast-off in NY! DeSoto, Madu shine in TX! Ajee Wilson (Neptune NJ) won the women's 800m run with a quick 2:05.19 clocking. Ben Malone (Pascack Valley NJ) finished 10th in the 2nd section of the boys 1500m run with a time of 3:49.84. Cain and Panisse light up the girls 800. Watkins closing speed seals the deal in the boys 800. Samantha Nadel and Dan Lennon roll in the 3200m run. Mary Cain just went further into the record books with a huge 2:03.34 in the 800m run, splitting about 58 seconds through 400m. The time puts her at US#10 All-Time and sets the NY state record for the event. 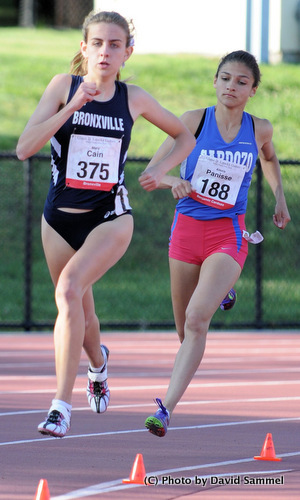 Alexis Panisse (Benjamin Cardozo) was 2nd with a quick 2:06.44. Impressive in 3rd was frosh Emma Gallagher (Garden City) in 2:09.80 and Brianna Nerud (North Shore) 4th in 2:10.09. 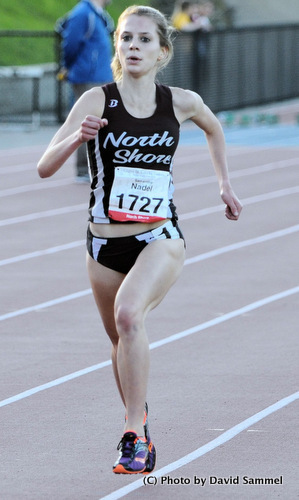 Samantha Nadel (North Shore) just rolled in the 3200m with a time of 10:16.85! 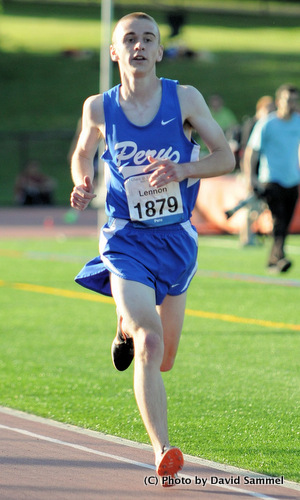 Dan Lennon (Peru) won the boys 3200m run with a NY#1 clocking of 9:00.4. Zavon Watkins (Liverpool) won the boys 800m run with a quick time of 1:50.78. St. Benedict's Prep (NJ) rocked the DMR with a quick 10:08.92 clocking for the win. 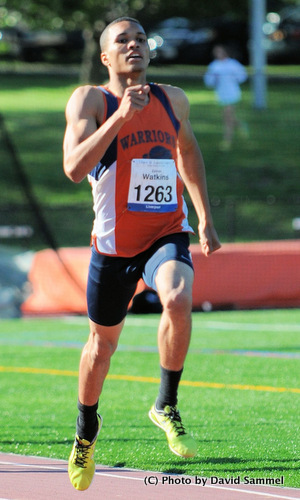 Chariho (RI) was 2nd with an impressive time of 10:11.72. Lampron (black Elite jersey) enroute to his 3:45 1500m clocking. Hatton (594) on her way to a 4:18 clocking over 1500m. 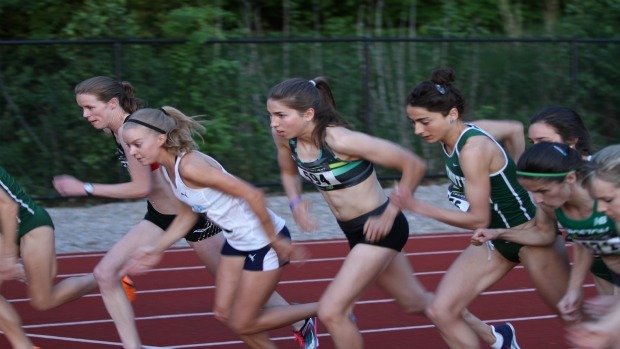 Cayla Hatton (Phillips Academy) lodged another impressive performance, this time dropping down to 1500m and running a US#2 clocking of 4:18.65. 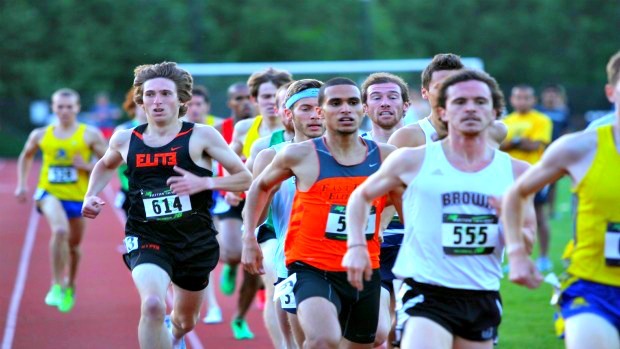 Josh Lampron (Mansfield) ran impressively over 1500m as well, running a US#1 3:45.74. 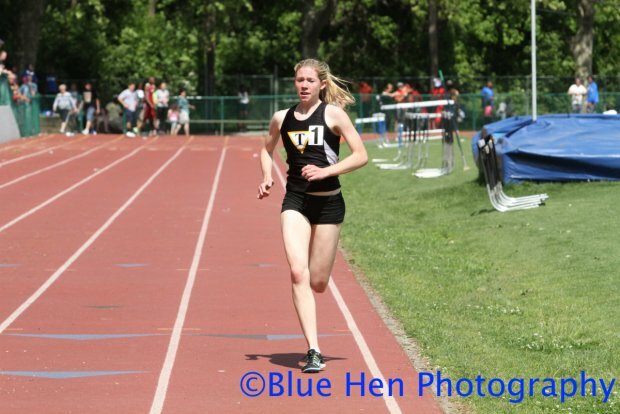 Haley Pierce (Tatnall) ripped a fantastic double win, running a 4:43.96 to win the 1600m run and a 2:12 to win the 800m run. Mountain Pointe rolling to the record in AZ! 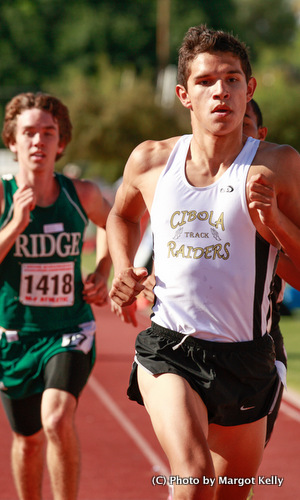 Montoya on his way to 1600m gold. In an interesting twist Bernie Montoya lost about 50 meters in the 1600m run but still came back to win with a time of 4:12! 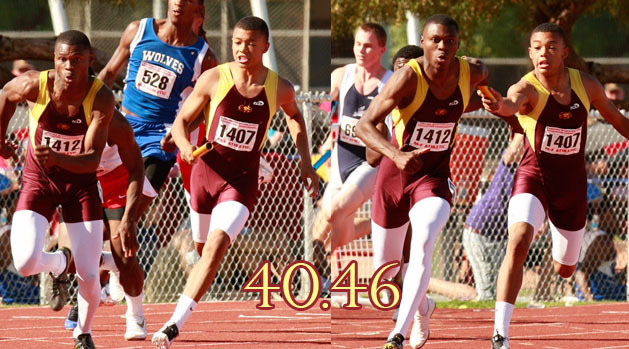 Mountain Pointe boys won the 4x100m relay, storming to an AZ state record and US#5 clocking of 40.46! Trae Armstrong took down Devon Allen in the 200m dash, running a US#2 time of 20.74 as Allen ran 20.75! 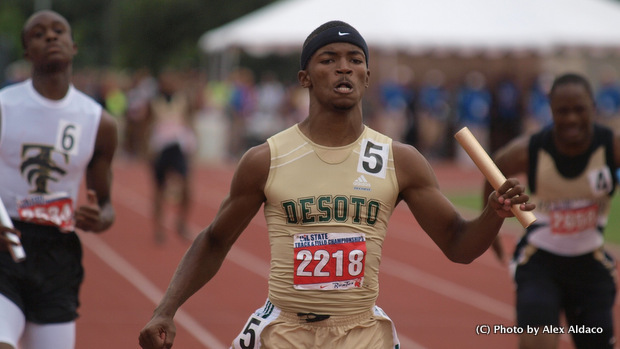 DeSoto blasted a 40.09 in the 4x100m relay, a tie for US#5 All-Time! Courtney Okolo setting her 400 record in TX on Friday night. Desoto boys set fire to the track in the 4x100m relay, blitzing their way to a tie for US#5 All-Time with a 40.09 clocking. The time is also the 9th fastest ever including multiple times from the same team in the same year. Abraham Hall (South Grand Prairie) won the boys 5A 200m dash with a blazing 20.58 clocking and really lit up the track in the 100m dash as he blasted a US#1 10.19 clocking! Reese Watson (Spring) won the 5A boys pole vault with a mark of 17-00. Mansfield Timberview girls led an amazingly deep 5A 4x400m relay with their winning time of 3:40.51! 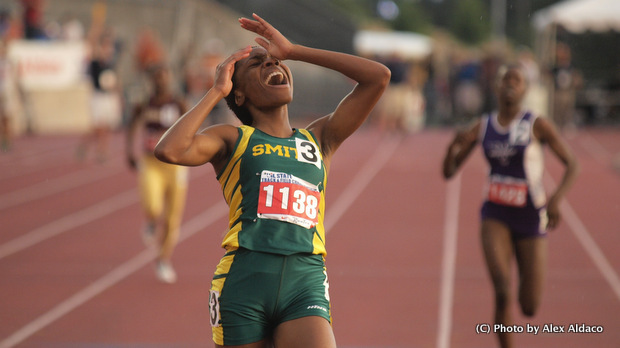 DeSoto was 2nd in 3:44.23 and Duncanville was 3rd in 3:44.56. Eight teams were under 3:50 in the race. Galena Park North Shore won the 5A 4x200m relay with a US#13 All-Time performance of 1:24.26. Shelbi Vaughan (Mansfield Legacy) won the 5A girls discus throw with a toss of 187-10. Jennifer Madu (Plano East) was a quadruple winner in 5A, taking the 100m dash in 11.53, the 200m dash in 24.03, the long jump with a leap of 19-08.75 and the the triple jump with a mark of 42-04.25. Allex Austin (San Marcos) won the boys 5A high jump with a leap of 7-00. Felix Obi (El Paso Franklin) won the boys 5A triple jump with a stellar 50-11.25 leap. Hector Hernandez (Kileen Ellison) won the boys 800m run with a thrilling finish in 1:49.33 over Xavier Moss (Houston Westside) in 1:49.99. Aldrich Bailey (Mansfield Timberview) rolled in the 400m dash with a fast 45.92 to take the win. Craig Nowak added to his early 3200m win with a win in the 1600m in 4:06.65 with an out-of-this-world last lap of 55.53! Duncanville won the boys 5A 4x400m relay with a time of 3:14.38 with Converse Judson 2nd in 3:14.63. Aldrich Bailey torched the track with a 45.48 anchor but Mansfield Timberview only managed 3rd in 3:14.66. 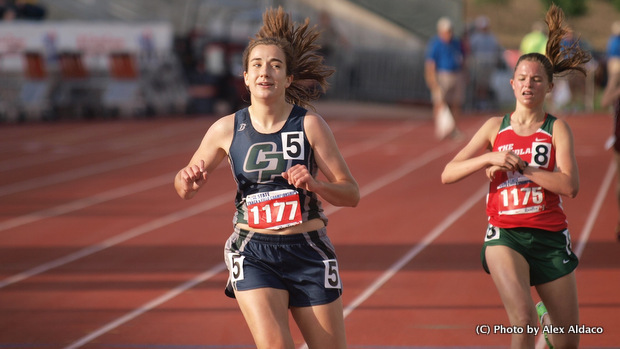 Katie Jenson (College Park) broke the state record in the girls 3200m run, winning with a time of 10:24.80. Madi McLellan (The Woodlands) was 2nd in 10:26.05. Craig Nowak (Cypress Woods) blasted the last 400 in 57s to win the boys 3200m run in 8:59.72. Courtney Okolo (Carrollton) won the girls 4A 400m dash with a TX state record of 52.40!! Okolo then came back rather quickly to win the 4A 200m dash in 23.87. Bealoved Brown was 2nd in 24.04. Okolo wasn't done however, as she anchored a thrilling come-from-behind victory in the 4x400 relay, giving Carrollton Newman Smith the victory in 3:47.11 with an anchor split of 52.89. Lancaster was 2nd with a time of 3:47.83. In the boys 4A 4x400m relay El Paso Burges won with a quick 3:14.59, but close behind were Denton Ryan in 2nd, 3:15.13, and McKinney North in 3rd, 3:15.17. In boys 3A action Jarrion Lawson (Liberty) won the boys long jump with a US#1 leap of 25-08!! Lawson also won the 3A boys triple jump with a stellar leap of 51-10.25. Lancaster girls roll in the 4A 4x100m relay, winning with a fast 45.85 clocking. Little Elm was 2nd in 46.23 and Beaumont Ozen was 3rd in 46.26. Fort Worth Southwest won the boys 4A 4x100m relay with a swift 40.90 clocking, barely getting by Lancaster, also timed in 40.90. Mansfield Summit was 3rd in 41.11. Cali Roper (Willis) won the 4A 3200m run with a quick 10:35.19, just getting by Natalie Rathjen (Highland Park), who ran 10:37.08 for 2nd. In the girls 4A 800m Meschelle Gills (Manvel) won with a quick 2:09.82 clocking to narrowly defeat Arin Rice (Canyon) with a time of 2:09.90. Melissa Gonzalez (Creekview) won the girls 4A 100H with a time of 13.92. Bryce Grace (Dallas Adams) won the 4A 110H with a fast 13.79 clocking. Xavier Morris (Houston Yates) was 2nd in 13.92 and Tequille Jackson (Lancaster) was 3rd in 13.93. Cameron Burrell (FB Ridge Point) won the 4A boys 100m with a quick 10.57 clocking. Antwuan Davis (Bastrop) was 2nd in 10.58. Kabroderan Handsborough (Crockett) won the 2A boys 100m dash in a fast 10.55, crushing the competition in his race. Bealoved Brown (Beaumont Ozen) won the girls 4A 100m dash with a time of 11.83. Lancaster girls won the 4A 4x200m relay with a time of 1:36.53 with Crowley 2nd in 1:38.17. Lancaster boys were racing fast in the 4A boys 4x200m relay with a time of 1:24.89! Fort Worth Southwest was 2nd in 1:25.45. Chris Willis (Platt) won the 4A boys 400m dash with a quick time of 47.06. Shawn Barber (Kingwood Park) won the boys 4A pole vault with a leap of 16-00. Lexington boys won the 4A 4x800m relay with a state record clocking of 7:48.95. Wando girls won the 4A 4x800, also with a state record time of 9:25.40.